Tezpur University MBA admission process will be begun, the candidates who are interested in pursuing MBA from Tezpur University can apply by the second week of December 2017. The last date to apply for MAT Candidate is in the second week of January 2018. The candidates who are going to appear in next Common Admission Test (CAT) exam or next Management Aptitude Test (MAT) exam are eligible to apply for Tezpur University MBA. MBA at Tezpur University, Assam is a 2-year full-time program for both fresher and work experience holder. Tezpur University is conducting all the process related to MBA admission for the session 2018-20. Dual specialization in combinations from Finance, Marketing, Operations, Human Resource & Information Technology. Total MBA Seats: 46 seats + 4 seats under Self Support Scheme (SSS). Education qualification: The candidate must have done graduation or equivalent courses from the government authorised College or University or Institute. General category applicant should have secured minimum 50% marks and other reserved category candidates should have secured minimum 45% marks in their graduation. Candidates, who are in their final year of Graduation or waiting for their final result, can also apply for Tezpur University MBA. After selection for the MBA, such candidates will be allowed to join the program according to university provision. Qualifying examination: All candidates desirous to get admission in Tezpur University MBA must appear in next Common Admission Test (CAT) exam or Management Aptitude Test (MAT) exam to be held in December 2017. STEP 1: Register: First, the candidates have to visit the official website of Tezpur University and register there. After registration, the candidate will receive the one-time password for verification on the registered mobile number. Now the candidates have to log in with registered email id and the password then select MBA as a program name and then click on apply and continue button. STEP 2: Fill the Application Form: After reading all the instructions, the candidates have to proceed with the online application process. Now the candidates have to start filling up the application form and save the information in every step. Now the candidates can review all the steps and also can edit or change the information if needed and then the candidates have to click on “Final Submit” button. STEP 3: Pay the Application Fee: After clicking on “Final Submit” button, the candidates will directly enter the process for online payment of the prescribed application fee and the candidates have to follow all the instruction to make payment. The candidates can make payment only using Net Banking or Debit Card or Credit Card. After successful submission of the application form, the candidates will see the confirmation final submitted form on the screen and the candidates are advised to take a printout of it for future use. The following scanned documents are required to be uploaded in step 4 of the application process. CAT or MAT registration proof. Caste certificate (If the candidates belong to SC or ST). Doctor’s certificate (If the candidates are physically disabled). The candidates have to submit the application form through online mode only. There is no need to send the application form or any other document to the university, however, candidates are advised to keep the printout of the duly filled application form for future reference. The candidates must note that while filling the MAT Application form they have to tick 'TEZPUR UNIVERSITY' and 'Non -IIm Institutes while filling the CAT Application form. The Late fee is Rs 200 for only MAT candidates. 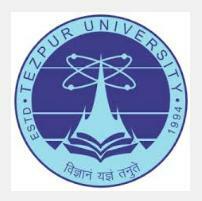 Scholarships are provided to meritorious MBA students at Tezpur University who are from the weak economic background. These scholarships are offered by various Government / Semi-Government organizations such as NEC, DBT, ITDP, MNES, DTE, AICTE, ONGC and by other agencies. T & I Global India Ltd.